✈INTELLIGENT INDUCTION SUSPENSION FLYING - There are induction launcher and induction receiver at the bottom of the ball. When the kid turns on the switch, it will automatically begin to fly in 2 or 3 seconds. The flying ball can sense the object downward or nearby and it will move away intelligently. The toy will fall at some height, but the induction function makes it easy to go up when the kid put their hands underneath. Novel and amazing play! ✈DAZZLING AND COLORFUL LED LIGHT - Unique design makes this kid toy change colors infinitely when flying. When it is on, it will emit bright, shining and colorful light, very attractive to eyeballs. It can sparkle and shine in darkness. 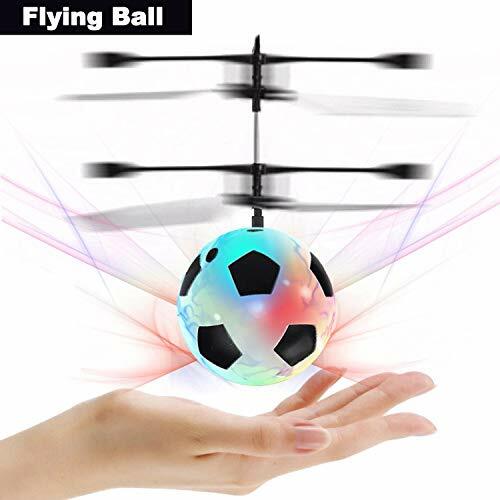 The flying ball shall be the perfect toy or christmas gift to the kids especially boys. ✈RC HAND CONTROL - Adopts advanced LED infrared sensor hover technology to make it motion-sensitive so it detects nearby objects and is programmed moves away from them. The idea is that you launch it and then hold your hand underneath it to keep it in the air. It continuously detects your hand and moves away from it. You or your kids, families will enjoy this amusing and fantastic process. ✈MULTIPLE PROTECTIONS - Flying protection: when the kid switches the flying ball on, the ball will automatically sense the objects underneath and fly away; power-on protection: when you turn on the switch, the flying ball will delay the flying for 3 seconds to ensure safety; collision protection: when the toy hits things, it will shut down automatically to avoid damage; environmental protection: made of non-toxic abs material, the flying ball is safe to your kids as well as the environment. ✈DELICATE AND LIGHT - Light weight makes it easy to fly with simple operation, especially designed for beginners like little kids. It is easy for little boy or girl to learn and control. The blades and balance beams are well-made with high flexibility and resistance to meet little kid's needs. So when it falls, the helicopter is very sturdy and will resist damage. All of the details ensure you and your children enjoy a beautiful time together.